Indonesia’s proposed palm oil moratorium combined with buyers’ No Deforestation, No Peat, No Exploitation (NDPE) policies impacts industry growth potential. Within current concession areas, the moratorium adds regulatory risks to market access risks for companies that proceed with developing forests or peatland. Outside these existing concession areas, there is a material loophole in the proposed moratorium for land classified as ‘convertible production forest’ (HPK). However, this loophole is essentially closed by stranded land risks caused by NDPE policies. West Kalimantan has 2.2 million ha of land suitable land for palm oil development outside of its current licensed palm oil concessions. But, because of the moratorium and NDPE policies, at most 2.6 percent of this land is available for future viable oil palm concessions. Likely responses to NDPE market innovations and the moratorium are an increase in smallholder investments, industry consolidation and vertical integration. Productivity improvements and international expansion are less likely to materialize in the short term. 365 companies globally have zero-deforestation or NDPE supply chain commitments driving market innovation in the Indonesian palm oil sector, leading to risk mitigation. After 25 years of aggressive palm oil development, which saw concession areas grow from 1 million ha to 21 million ha, the Government of Indonesia is now taking steps to limit further landbank expansion. These measures come at the same time that compliance with No Deforestation, No Peat, No Exploitation (NDPE) is increasingly becoming a condition for market access and that public monitoring capacities are rapidly improving. These trends increase pressures within the Indonesian palm oil industry to seek other growth strategies. On April 14, 2016, Indonesian President Joko Widodo declared his intention to impose a moratorium on new palm oil concessions. This moratorium follows a series of measures taken since 2009 to curb the environmental impacts of the sector. This includes a 2-year forest moratorium last extended in 2015. Recently, the Government of Indonesia also amended the peatland moratorium and the Indonesian Sustainable Palm Oil (ISPO) certification system. The final text of the palm oil moratorium remains under development. A draft version has been circulated. Buyers’ NDPE palm oil demands have led to material stranded land. Stranded forest and peat lands exist within concessions that cannot be developed without violating NDPE policies and Government of Indonesia regulations. The proposed palm oil moratorium further limits landbank growth outside land for which concessions have already been granted. President Jokowi’s announcements should be seen in the context of Indonesia’s efforts to address their multi-decade fire and haze crises and to implement the objectives of the Paris Agreement, which it ratified in October 2016. Development of the downstream palm oil industry. Development of smallholder palm oil farmers. Reducing Emissions from Deforestation and forest Degradation (REDD+). President Jokowi aims to increase productivity on existing plantations through replanting and through smallholder capacity building. He wants to simultaneously reduce further geographical expansion of the palm oil industry. “Current plantations are enough, as long as the seeds are proper, it is possible to double productivity“. These policies are expected to prompt companies to boost their refining capacity within Indonesia. A suspension of the issuing of any new palm oil licenses and forest release permits. An evaluation of existing palm oil licenses and forest release permits. The Ministry of Environment and Forestry is ordered to halt the issuing of new forest release permits, and postpone all outstanding permit requests. The Ministry is furthermore ordered to evaluate all forest release permits that have already been granted for 1) areas not yet cleared; 2) permits that have transferred to new owners; and 3) permits that are not used in accordance to the prevailing regulations. The Ministry of Agriculture is ordered to conduct capacity building for smallholders and to collect data on, map and evaluate existing palm oil concessions. It will also encourage plantations to adopt ISPO standards and assist in the rejuvenation and replanting of existing plantations using improved seeds. Among other things, the National Land Agency is ordered to evaluate the land use on concessions every six months for a period of two years, to accelerate the issuance of formal land rights to communities and to revoke concession licenses for productive forestland that is not being used. Governors, district heads and mayors are ordered to postpone the issuing of principal location permits and clearing permits for new palm oil plantations. After the presidential moratorium is issued, it will go into effect for a period of five years. Because the moratorium is an Inpres – Presidential Decree, moratorium violations are subject to administrative sanctions as opposed to criminal penalties. On May 1, 2016, shortly after the moratorium was announced, the Minister of Environment and Forestry Siti Nurbaya indicated she had already ceased the entire process for the issuance of new palm oil licenses. Reportedly, these applications covered a total of 851,000 ha. Permits that had already been approved in principle were also revoked. This covered an additional 600,000 ha. A major limitation to this moratorium is that it excludes Convertible Production Forests (HPK). This concerns forested land designated for non-forestry purposes. The exception might create a material loophole as licenses could still be legally issued for these areas once the moratorium comes into effect. Large tracts of land in Kalimantan and Papua are designated as convertible production forests. West Kalimantan has a total of 142,026 ha designated as convertible production forests. The Minister of Environment and Forestry Siti Nurbaya stated that millions of hectares of forest in Papua and West Papua are outside of moratorium’s scope and they could be developed into palm oil plantations without violating the moratorium. The Minister indicated she had ceased the entire new palm oil license issuance process. She also stated she had given the order to stop issuing new permits for palm oil in convertible production forests. Furthermore, the 5-year palm oil moratorium might create an incentive not to extend the current forest and peatland moratorium once they expire in 2017. This could not only open up forests to commodities other than palm oil, but could also put the peatland within concessions at risk as the palm oil moratorium only evaluates the forest release permits within the concession areas. 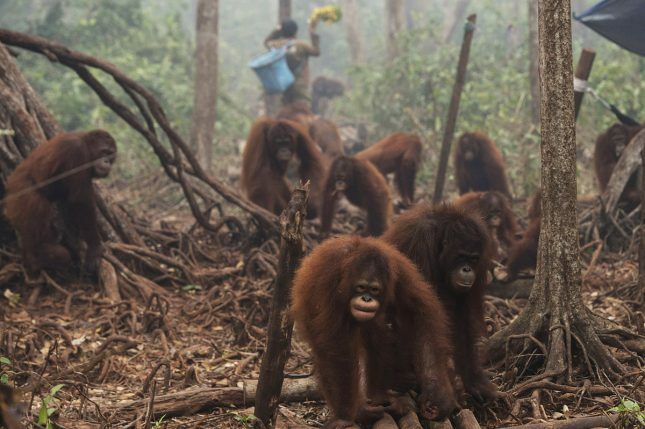 As discussed in the Chain Reaction Research briefing on stranded land in Indonesia posted on Seeking Alpha, Indonesian palm oil concessions contain 6.1 million ha of forests and peatland. This land has become stranded as a result of buyers’ NDPE policies. A large majority of clients will refuse to purchase palm oil from growers that continue to develop forest or peatland. The proposed palm oil moratorium will have impacts on availability of land that are additional to the impacts of NPDE policies. The moratorium is a land use policy by the Government of Indonesia to address the palm oil industry’s negative environmental and social impacts. Changes in land use policy are shown to create stranded land risks for palm oil companies’ concessions. For palm oil growers, these policy-related risks add to the stranded land risk created by their buyers’ and financiers’ NDPE policies. The proposed palm oil moratorium includes evaluations of existing licenses and might result in the revoking of forest release permits. As a result, development of any of the 6.1 million forested or peatland can put a concession holder’s license at risk. Such risks come on top of market risks created by buyers’ NDPE policies. For land outside of current concessions, the moratorium and NDPE policies have clear impacts on the industry’s expansion potential. Regardless of land cover, the moratorium would halt further palm oil expansion on land categorized for Other Land Use (APL). The moratorium’s loophole of Convertible Production Forest (HPK) is essentially closed by the stranded land risks resulting from buyers’ NDPE policies. As such the geographical expansion potential for palm oil in Indonesia would be severely limited once the moratorium goes into effect. Detailed analysis of the classification of West Kalimantan’s land cover illustrates the scope of these impacts. Taking into account NDPE and legal licensing requirements, a maximum of 58,000 ha would remain in West Kalimantan that is viable for oil palm concessions. This equals 2.6 percent of suitable land outside of current concessions. West Kalimantan’s total land area is 15 million ha. 4.2 million ha within this province has been allocated for palm oil concessions. Until the moratorium comes into effect, licenses can legally be granted on land classified as Other Land Use and Convertible Production Forest (HPK). Land classified as APL or HPK totals 2.6 million ha, of which 2.2 million ha is suitable for palm oil concessions (this excludes water bodies and other undevelopable land). As shown in Figure 1 below, the moratorium’s restrictions reduce available land to 142,000 ha. Figure 1: Land classification for land outside of concessions in West Kalimantan, 2016 (HA). Source: Aidenvironment. Figure 2 below shows the APL and HPK classified land outside of granted concessions. All APL land (presented in green) would be off-limits under the moratorium. The HPK land (in red) could still be licensed out under the above-mentioned loophole. Figure 3: HPK land classified outside of concessions in West Kalimantan, 2016. Source: Aidenvironment. Once the moratorium comes into effect, further growth of palm oil land banks through the issuance of licenses is essentially halted for the next five years. Measures that apply to existing concessions including potential suspension of licenses when 1) concessions are not developed in accordance with regulations, 2) concessions are transferred to a new owner or 3) concessions include productive forest areas. The Indonesian Palm Oil Association (GAPKI) suggested, after the moratorium was announced, that it threatened palm oil output growth and industry investment. But the Ministry of Economy has calculated that existing plantations are sufficient to produce 40 million metric tons CPO by 2020, up from 31 million metric tons in 2015. Several of the larger palm oil companies as well as the Indonesian smallholder union furthermore voiced their support to this proposed palm oil moratorium. Projecting the impacts of these combined developments on the palm oil industry over the five-year time period after the moratorium is enacted, five growth strategies are possible as alternative to geographic expansion. The moratorium might spur both government and plantation company investments in smallholder schemes. With expansion through new concessions challenging, business models in which mills rely on supplies from smallholders and outgrowers might proliferate. Investments may be made to increase smallholders’ productivity. Companies may transfer existing land or new land to these outgrower schemes. Mergers and acquisitions may increase industry consolidation. Smaller plantation companies are likely to become takeover targets as larger firms look to increase their market share. As organic growth becomes more difficult because of stranded land and limits to landbank expansion outside of existing concessions, the industry growth may occur through mergers and acquisitions. There are signs of consolidation already taking place. For example, Genting Plantations recently purchased the rights to develop a 21,995 ha plantation in West Kalimantan. On the other end, Provident Agro is selling its shares in four subsidiaries in response to the moratorium announcement. Plantation companies might also explore options for downstream investment and vertical integration by partnering with processing and trading companies to develop refineries, storage terminals and ports. While it is unlikely that plantation firms possess the knowledge and expertise to be able to compete in this market alone, it might be attractive to form joint ventures with more experienced players. For example, Kencana and Louis Dreyfus Company have a joint venture and Astro Agri Lestari and KLK have a joint venture. President Jokowi’s stated objectives include increasing the productivity of existing oil palm plantations. Several companies and industry players have echoed this objective. For example, Golden Agri-Resources is actively replanting some of its older plantations. Sime Darby’s subsidiary PT Minamas Plantation stated its palm oil yield might increase 67 percent from replanting. Replanting might not be an attractive option for firms with less access to finance for operational expenses, smaller firms or firms with younger plantations. As reported by Chain Reaction Research and published on Seeking Alpha, in Liberia, Sime Darby signed a 63-year concession agreement in 2009 for 220,000 ha of land to be developed into oil palm and rubber plantations in Liberia. An additional 44,000 ha are to be developed under an outgrower scheme. To date, Sime Darby has planted 10,411 ha palm oil and 107 ha rubber. The limited expansion opportunities in Indonesia might drive overseas investments to countries such as Papua New Guinea and regions such as mainland Asia, Africa and Latin America. International expansion can come with significant operational, financial and reputational risks. For example, many palm oil investments in Africa are slow to materialize and face material environmental and social risks. For example, Chain Reaction Research’s profile on Sime Darby demonstrates the challenges facing large-scale concession models. These lessons learned from the Liberian experience may reflect the possible challenges facing other global investment opportunities.